“Apprehension” isn’t really the right word for what V had been feeling as she approached her due date; “naked terror” really doesn’t capture it either. But imagine, if you will, the prospect of giving birth (scary enough even under the most controlled circumstances) in another country, 5000 miles from home, surrounded by doctors and nurses who don’t speak English, in the midst of a labyrinthine and unfamiliar healthcare system, aided only by your knucklehead husband, whose slippery grasp of French often allows him just enough understanding to get everything completely wrong. But nature always gets the last turn at bat. Babies get born despite incomprehensible paperwork, obstetrical practices mired in the 1960s, and knucklehead husbands who forget their Lamaze breathing patterns at the worst possible moment. And V was a champ, toughing it out through 25 hours of labor without medication, at one point backing down a Francophone obstetrician with a well-chosen Anglo-Saxon colloquialism delivered with such volume and emphasis that no translation was necessary. Thus was the Tadpole brought into this world: June 27th at 9:33 AM Lyon time, 3.54 kilograms. The day before V went into labor, there was a brief but violent thunderstorm. 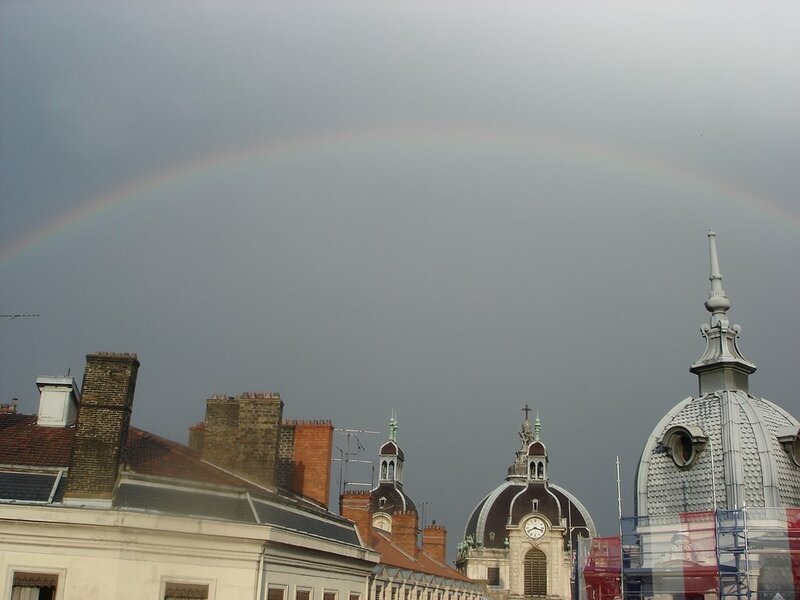 When it moved off to the east, this rainbow appeared in the sky over Hotel-Dieu--a full 180-degree arc, with each color clearly delineated. It had already started to fade a bit by the time I remembered to break out the camera, so this doesn’t really do it justice. More later after I’ve regathered my wits a little and gotten some sleep. The success of the French team in the World Cup hasn’t been helping, by the way: after their shocking win over consensus favorite Brazil, our street below turned into Franklin Street after a UNC national championship (with fewer bonfires, but more scooter horns blaring). I had been pulling for them in a neutral sort of way after the US bowed out, just for the sake of a more interesting environment, but now…I hope Portugal beats ‘em by a touchdown. Yay for you guys! Congratulations on the little guy! Good work getting the birth you/V wanted! I look forward to hearing more about that experience and about long hospital stays and family leave. Pam's photos looked great. A fine looking young man, and, nice apartment, to say the least. We'll look forward to seeing more. "…I hope Portugal beats ‘em by a touchdown." Even better, les Bleus embarass themselves in the process of losing. CONGRATULATIONS!!! How is J doing now that the Tadpole has arrived? My best to Vivian--I can't imagine going through that. Good thing that cursing is universal.